What happens when artists, writers and performers get together and decide to mount an exhibition? If the group is Durango’s elusive Art Discussion Group, they decided to explore the meaning of “Home” and turn it into a well-attended opening night event Friday at the Fort Lewis College Gallery. According to Amy Wendland, a group member and FLC art department chairwoman, the show came about organically. The artists didn’t discuss what they were creating with one another. There was no juror or curator, no restrictions or limits. The Art Discussion Group is made up a broader list of artists, writers and performers than the 17 in the exhibit. Wendland said the e-mail list is much larger. “Some attend discussions regularly, others come and go,” she said. The group meets monthly and has a predetermined topic that they discuss. There is no formal organization, no posting of meetings, no invitations to participate. To some it may seem a closed and exclusive group. To those who participate, it is a supportive community of friends and colleagues. The Home exhibition features the work of internationally known artists Ilze Aviks and Mary Ellen Long, along with other popular local artists Deborah Gorton, Tirzah Camacho, Louise Grunewald, Barbara Tobin Klema, Maureen May, Chyako Hashimoto, Judy Brey and Wendland; writers Judith Reynolds and Katherine Leiner; and choreographer Judy Austin. Less well-known among the exhibitors are Terry Hobbs, Kris Hill, Christina Erteszek and Linda Robinson. The theme of home allowed for wide interpretation. The ex hibit features painting, photography, sculpture and crafts like ceramics and as quilt-making. Some of the work is highly personal and moving. “Death Comes Home” is a quilt made by cartoonist and critic Judith Reynolds from shirts and ties that belonged to her late husband, David Reynolds. “New Home, 1977” is an elegant tapestry by Ilze Aviks accompanied by a story of how she moved to Perth, Australia, and one day on the beach, her husband pointed to the nearest land mass to the west: South Africa. She was suddenly very aware of distance. “Journey’s Beyond and Back Home,” by Mary Ellen Long, is an artist book visually describing her journey across the United States from home to home. Louise Grunewald’s “Home” is a Coptic bound, vibrant-hued book detailing the journey she and her friends took to launch the show and what exploring the theme meant to her. “What Are You Looking For?” a mixed-media sculpture by Maureen May is about the contrast of two lives, a husband and wife, one a visual artist, one a writer. Wendland’s interpretation of home was less personal. “Small Town” provides a commentary on what it means to call Durango home. 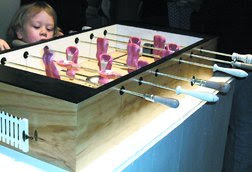 The sculpture is a foosball game made from tongues. The center of the game features an open mouth with teeth agape. The illusive white picket fences are the doors that hold the oversized balls in the court. The work was a hit with children, who couldn’t resist playing. Author Katherine Leiner read at the reception in front of her installation of desk, typewriter, chairs, books and handwritten notes. Her piece was a work in progress about writing and home that was funny and poignant. Judy Austin choreographed a lovely dance in a black cube performed beautifully by high school students Lexy Silva and Terra Anderson. The artists assembled all of the cliches of home in their exhibition along with more avant-garde expressions that hold it all together. “Home,” 10 a.m. – 4 p.m., Monday-Friday, mixed-media show at Fort Lewis College Gallery, Art Building, through Feb. 13, 247-7167.